EVERY company that needs customers also needs a successful lead generation and qualification program. I work with software and hardware companies but this is a universal truth for all customer-oriented companies. But how people go about it can vary wildly, depending upon their circumstances–and most of all–their own background and comfort level. 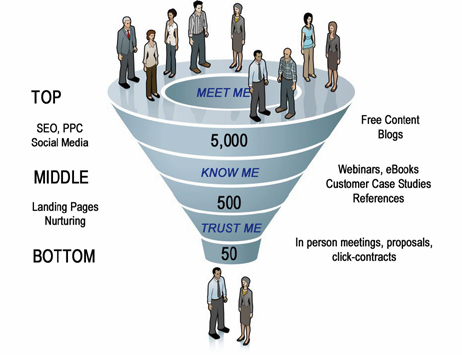 There are many different ways to generate leads–PPC ads, online banner ads, SEO, print ads, trade shows, direct email, direct snail mail, PR, etc, etc, etc. It’s not infinite but there are many methods. To some extent, the business you’re in should dictate how you go about generating leads. For example, if you’re in a small, well-defined and tightly-focused niche market and selling a multi-million dollar product, going to a trade show where all the important players gather might be your best bet. If you’re in a broader market with a low-priced product, going to trade shows might be an very inefficient use of your always scarce marketing budget. In this case various forms of online marketing is probably the best approach. But I find that in many cases folks go about the lead gen and qualification process not in any objective way, but in the manner in which they’ve become comfortable. This comfort level might have developed in the early, formative years of their career or possibly during the most successful period. I’ve said before that executives have a tendency to fall back on what I call their “common business sense”; a set of internal rules developed via past experiences that they’ve come to rely heavily on in their business decision making. While having a stable base of beliefs to rely on can be useful and is certainly comforting, it can also mislead you in dynamic areas such as lead generation. This is especially true in technology-based markets, where innovation tends to make yesterday’s rules-of-thumb obsolete quickly. Imo, one of the most important attributes of a successful senior exec is the ability to walk away from their comfort level in areas where technology disrupts a market and place small bets to find new ways of creating business. Nothing works forever in hi-tech marketing; indeed, the newest, “least-clogged” method is often the most productive. One of the great challenges of technology marketing & sales is staying ahead of the herd. Once upon a time back in the 50’s when onsite sales visits was the order of the day, a few telesales/telemarketing pioneers started the first companies dedicated to that practice. As a consumer you may rue the day this “innovation” occurred, but it had a profound effect on business worldwide and greatly enhanced the marketing efficiency for certain types of products. I’m guessing that conversion rates were phenomenal back then. This particular marketing channel is much more difficult today, whether B2C or B2B. Internet marketing as a whole has had a similar effect in revolutionizing marketing. As an example, PPC advertising initially was initially extremely profitable. Now that it’s a mainstream activity, it’s much more difficult to show a return. And so it goes, on and on. There is much to gain by finding the “next big thing” methodology of how to generate leads and customers ahead of the rest of the herd. Because of this, it’s incumbent upon tech CEOs and senior marketing and sales execs to dedicate at least a small portion of their budget to experiment with new lead gen methods. There is a tendency to want to require a solid ROI from every line item in the marketing budget. While I support this approach in general, I believe it’s critical to also have a “slush fund” dedicated to finding that next high-ROI marketing method. In most companies lead generation is a highly discussed and scrutinized process; lead qualification is one that is much less so. The only people even possibly obsessed with it is the VP-Sales and his team–and that is generally in the context of bitching about the low quality of leads provided by outbound marketing. The most important thing to recognize in this discussion is that in most cases there is an inherent tradeoff between the quantity and quality of leads generated. This not be so true if your lead generation method is of the more “traditional” methods, say face-to-face prospecting at a trade show. In this case, you have the luxury of “qualifying away” in your discussion with a prospect. You can tell by his/her body language and what he’s telling you how far you can go with your qualification efforts. Test, test, test – In reality, there is no perfect lead form. There’s only one that meets your company’s particular needs at that particular time. But in an attempt to get that lead form built optimally, don’t let sales and marketing continually argue about it. Create a lead form from your best joint hypothesis, measure whether or not the resulting leads are appropriate for your circumstances, then iterate the form (with an A/B test vs. the old form). Then measure the resulting delta in lead quality and quantity. You’ll save a lot of time and energy in reduced arguments and at the end of the day your lead gen and qualification will be far closer to optimal. As I imply above, the single most beautiful thing about modern online marketing is the ability to make objective decisions. It’s no longer about the print ad a particular senior executive prefers; it’s about the hard ROI of every lead generation and qualification method. Indeed, it’s about every divisible step in these processes. I strongly recommend a comprehensive, continuous and objective A/B testing and measurement program whenever possible. This is sometimes referred to as Conversion Rate Optimization, or CRO. Sometimes resource constraints don’t enable you to test every little item and in some cases it doesn’t make sense. But even today few folks out there are doing this type of objective program, which can greatly enhance nearly every company’s marketing results over time. I find that the reason for this reluctance is due to fear or ignorance of not knowing where to start, far more often than lack of resources. In 2014 this type of objective testing and measurement is something senior management should insist on. So those are my somewhat random thoughts on the topic of lead generation and qualification. Am I making sense? What have been your experiences? Post a comment to fill us in. Learning to generate leads is the key to HUGE revenue for any business but its very hard to find the quality leads. I have read one of your old article where you linked this website- whitepapersource .com, which is really helpful to get the information about white paper marketing. Recently i came across http://www.whitepaperlisting.com and it looks great. We are thinking to advertise with them. Will update you if its a worth to promote with them.